During the rainy seasons, nothing can be done by Kenyan athletes about the rainy conditions and the muddy roads in the country. But, apparently, the need for good tracks with drainage systems to ensure that the athletes can train on it throughout the year, across the country are built is now more obvious, if the Kenyan athletes are to continue dominating the world of long distance running on the track. Many Kenyan athletes from various regions have been shifting to road running early in their careers due to the poor state of the tracks in the country. There are already two tartan tracks in the Rift Valley region, but contrary to what the average Kenyan athletes expected, the tracks have not been free and open to all athletes. 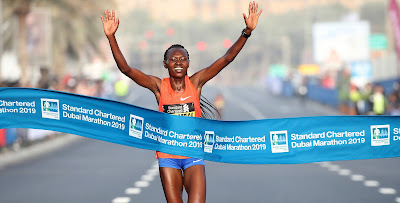 This is perhaps the reason as to why Kenyan athletes are beginning to lose their grip on being the greatest long distance runners on the track and are now taking their running talents to congest the road and cross country races across the world. It is also interesting to note that the tracks that the Kenyan athletes used to train on before, like the one in Nandi Hills, Kamariny Stadium in Iten and the one in Kapsabet have been closed for quite a while for renovation. If the athletes had a voice, they would have preferred the tracks to be left in the state they were until all the resources to renovate them were found. Rainy conditions have often interrupted the training of Kenyan athletes while preparing for the World and Olympic Championships that usually happen around the month of August. Until recently when Lornah Kiplagat opened a new tartan track in Iten and the Kipchoge Keino in Eldoret was also refurbished to become an all-weather track, Kenyan athletes have had to do their “track intervals” inside a forest in Kaptagat, inside tea plantations in Nandi and in other well-kept rough roads in various places across the training destinations in the Rift Valley. Before 2014, some athletes who strongly felt the need to do their training on a track after it had rained the previous day had to wait for the track facility at the University of Eldoret (Chepkoilel) to dry up so that they could get to train on it at around mid-day when it would be less muddy, and before it would rain again in the afternoon. But most other athletes would prefer to do their speed workouts on the rough roads instead, as they would easily find a portion of the road that was better off than the tracks around here, only that it was often hard to measure accurate distances on the roads. I remember some incidences in 2013 when I used to train in Eldoret and lived about eleven kilometers from the University of Eldoret. One Tuesday, I called one member of the group I was training in to ask about the time to meet on the track of which he replied that they were considering delaying it by an hour to allow some time for the track to get drier. It always took me an average of 50 minutes to jog to the track, and so I had to leave my phone in the house and start jogging in order to arrive there earlier than everyone else. I arrived there when almost half of the group, having not heard about the intended delay of time, was already there. Also present was a large group of marathon runners (the Global training group of Eliud Kipchoge) who would at times wait for us to start running around the track to make it dryer before beginning their workouts. On this day, we were not in any hurry and so they ended up starting their workouts of 1km repetitions of 2:45 minutes and 200m jogging as their recovery. With their training shoes stepping repeatedly on the track, it became dryer and we were lucky to begin our training when it was already better. Not all the members from my group turned up. I was later to find a missed call when I returned to my house from the same athlete I had called earlier as he had tried to inform me that they had decided to do a fartlek on the road instead. The rest of us who had turned up did 400m repetitions. It was not only the average athletes who were being affected by these conditions. I remember David Rudisha, the 2012 Olympic champion, had also turned up while we were in the middle of our training and he, with his group, did a few 300m workouts as well. I am sure he was careful not to run his maximum effort as anyone could have easily skidded and fell in such conditions. The speed workouts scheduled two days later that same week were the most affected given that out of the usual 40 athletes, only five of us turned up. It had rained the whole night and the sky was still covered with clouds and was drizzling slightly at around 10:30am as I set out to the track. It was a mere guesswork as to what could happen in the next ten or so minutes and I had taken some money in my pockets in order to board a vehicle and head back in case there was a downpour before I reached the track. Fortunately, it began to clear after some time. At the track were two foreign athletes doing 200m repetitions on one side of the track where they were running to and fro in order to avoid the other side of the track that was too muddy. After waiting for a while, we also decided to do an alternation of 200m and 150m intervals ten times on the same side of the field. Contrary to my expectations, it ended up being one of the best workouts I will live to remember. I still remember alighting from a vehicle I had boarded after the work out and for a moment my legs refused to move, but I could only laugh at myself because I knew that I had trained to my maximum for the day. I could not help but feel sorry for the more than 80% of the other Kenyan athletes who probably failed to do their speed work on the track that particular day due to the lack of a good track facility.